“We were able to send two of our children to university and one is now in secondary school because of vegetable farming,” Susana Agbakpe said. The 53 year old farmer whose one acre plot of land in Anloga, a town in the southeast of Ghana, mainly grows tomatoes, hot peppers, and shallot onions. Raising three children and taking care of them is one of the primary goals of Agbakpe and farming is a way to provide for them. 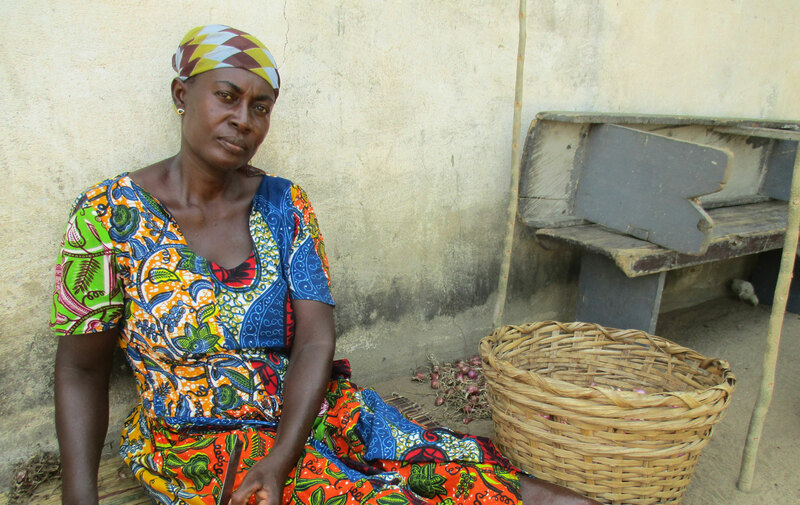 Contributing to her family’s survival can pose challenges when the climate becomes difficult. “When there is drought we use plastic tubes and tape to irrigate our field because the water table is shallow. This manual irrigation makes farming difficult,” Agbakpe said. Drought is not the only problem there is also disease but “We practice crop rotation. After we plant tomatoes we plant shallot onions to replenish the soil,” Agbakpe said. There are still difficulties besides the climate as well, economic difficulties. “It is hard as the price is beyond our control. It is terrible when the price is low but we have a lot of produce,” Agbakpe said. The Ghanaian farmer is trying different methods other than chemical pesticides to fight troublesome diseases and blight. “I am interested in using a gas fired soil sterilizer to remove pathogens, weeds etc,” Agbakpe said. “In the long run it is also cheaper to use.” This change in methods also helps with the economic problems, cutting down costs and increasing profits. At the end of the day Agbakpe is intent on taking care of her family, and because of that she is focused. “I am a serious and hardworking farmer,” she said and with three children to provide for, her focus is always on prosperity. Join our mailing list so that we can update you on our company news, innovations and product information. Copyright © 2019 East-West Seed. All rights reserved. East-West Seed companies or EWS companies have their own separate identities but in this web site we may sometimes use "East-West Seed” or “EWS”, "Group”, "we" or "us" when we refer to East-West Seed companies and EWS companies in general or where no useful purpose is served by identifying any particular East-West Seed company or EWS company. Welcome to the eastwestseed.com topsite. This web site is owned and operated by East West Seed International Limited, a company registered in The Kingdom of Thailand with registered number 0125543008928 whose registered office is at № 50/1 Moo 2, Sainoi - Bang Buathong Road, Sainoi Sub-district, Sainoi District, Nonthaburi Province, Thailand, Post Code 11150. Visitors to this web site are bound by the following terms and conditions, please read these carefully before you continue. By accessing and using our Website, you agree to accept and follow our Terms and Conditions. If you do not agree to accept and follow our Terms and conditions, you may not access, use or download materials from our web site. Please take a few minutes to carefully review them. East-West Seed grants you a limited license to access and make personal use of our Website and not to download (other than page caching) or modify it, or any portion of it, except with express written consent of East-West Seed. Our Website or any portion of our Website may not be reproduced, duplicated, copied, or otherwise exploited for any commercial purpose without express written consent of East-West Seed. You may not frame or utilize framing techniques to enclose any trademark, logo, or other proprietary information (including images, text, page layout, or form) of East-West Seed and our associates without express written consent. Any unauthorized use terminates the permission or license granted by East-West Seed. You are granted a limited, revocable, and nonexclusive right to create a hyperlink to the homepage of East-West Seed so long as the link does not portray East-West Seed, its associates, or their products or services in a false, misleading, derogatory, or otherwise offensive matter. You may not use any East-West Seed logo or other proprietary graphic or trademark as part of the link without express written permission. All contents included on our Website, such as text, graphics, logos, button icons, images, audio clips, digital downloads, data compilations, and software are the property of East-West Seed or its content suppliers and protected by international copyright laws. The compilation of all content on our Website is the exclusive property of East-West Seed, with copyright authorship for this collection by East-West Seed, and protected by international copyright laws. East-West Seed trademarks may not be used in connection with any product or service that is not East-West Seed, in any manner that is likely to cause confusion among customers or general public, or in any manner that disparages or discredits East-West Seed. All other trademarks not owned by East-West Seed or its subsidiaries that appear on our Website are the property of their respective owners, who may or may not be affiliated with, connected to, or sponsored by East-West Seed or its subsidiaries. Our Website is composed with care. However, East-West Seed does not give any guarantee whatsoever, express or implied, that the information, which - but not solely - includes variety descriptions and cultivation technical advice, contained in or referred to on our Website is complete and accurate and suitable for the purpose the website user may give to it. East-West Seed, therefore, accepts no liability whatsoever for damages resulting directly or indirectly from the use of our Website, including consequential damages or loss of profit. Furthermore, East-West Seed will not be liable for any damages, resulting directly or indirectly from inability to use our Website. Our Website may contain references to products, programs and services varieties that are not available in each and every a certain country. Such references do not imply under any circumstances whatsoever that East-West Seed will, or has the intention to, offer our products, programs and services in that country. (g) warranties relating to content or operation of other sites which is linked to our Website. East-West Seed reserves the right to update or modify these terms and conditions at any time without prior notice. Your use of our Website following any such change constitutes your agreement to accept and follow the revised Terms and Conditions. These Terms and Conditions shall be governed by, are subject to, and construed in accordance with, the laws of the Netherlands. All disputes will be settled in the Court having jurisdiction. However East-West Seed reserves the right to serve a summons on website user to appear in the court of the country where the latter has its registered office, or where the website user has a real and effective industrial or commercial establishment. This page is used to inform website visitors regarding our policy with the collection, use, and disclosure of Personal Information if anyone decided to use our Website. For a better experience while using our Website, we may require you to provide us with certain personally identifiable information, including but not limited to your name, phone number, and email address. The information that we collect will be used to contact or identify you. We want to inform you that whenever you visit our Website, we collect information that your browser sends to us that is called Log Data. This Log Data may include information such as your computer’s Internet Protocol (“IP”) address, browser version, pages of our Website that you visit, the time and date of your visit, the time spent on those pages, and other statistics. To assist us in analyzing how our Website is used. We want to inform our Website users that these third parties have access to your Personal Information. The reason is to perform the tasks assigned to them on our behalf. However, they are obligated not to disclose or use the information for any other purpose. Our Website does not address anyone under the age of 13. We do not knowingly collect personal identifiable information from children under 13. In the case we discover that a child under 13 has provided us with Personal Information, we immediately delete this from our servers. If you are a parent or guardian and you are aware that your child has provided us with Personal Information, please contact us so that we will be able to do necessary actions. Our Website uses these “Cookies” to collection information and to improve our Website. You have the option to either accept or refuse these Cookies, and know when a cookie is being sent to your computer. If you choose to refuse our Cookies, you may not be able to use some portions of our Website. Please note that you can manage Cookies in your browser settings. You may subscribe to our newsletter or you may contact us with questions with regard to our Website or products. If you receive any newsletter or email from East-West Seed, you will generally be provided with an automated way to opt out (unsubscribe) from all newsletters or particular communications sent by East-West Seed. Please follow the instructions on the email you receive. If you have any questions or suggestions about our Privacy and Cookies notice, do not hesitate to contact us.